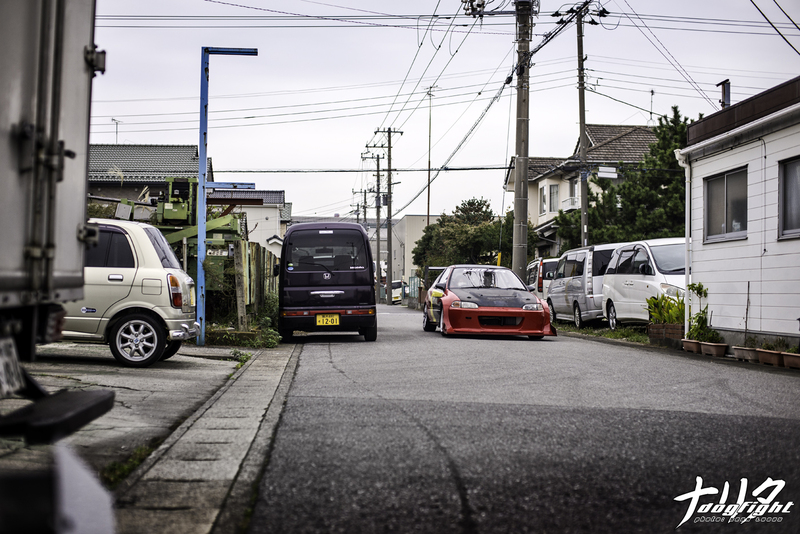 Over the past three years, I’ve had the privilege of visiting, and becoming friends with, many tuning shops in Japan – and that’s not something I take for granted at all. However, there is one shop in particular that I’ve come to favor just a bit more than the others (for several reasons), and that is, of course, Garage Work. Tora-san has dedicated everything to FF time attack that no doubt he is the undisputed leader of the niche class. Although, the success of his work isn’t actually what attracts me; it’s more about the way he goes about it. A part of me would like to describe it as rudimentary, but that term almost serves to downplay it more than anything. It’s a very straightforward, and foundational path that allows a simple fix for most issues. Whether it be adding downforce to the front end, tuning the suspension by spring rates (without the use of stabilizers), creating new gear ratios for each circuit, or finding time through reducing weight. Every impasse can be handled in a simple way, and simple is always superior. 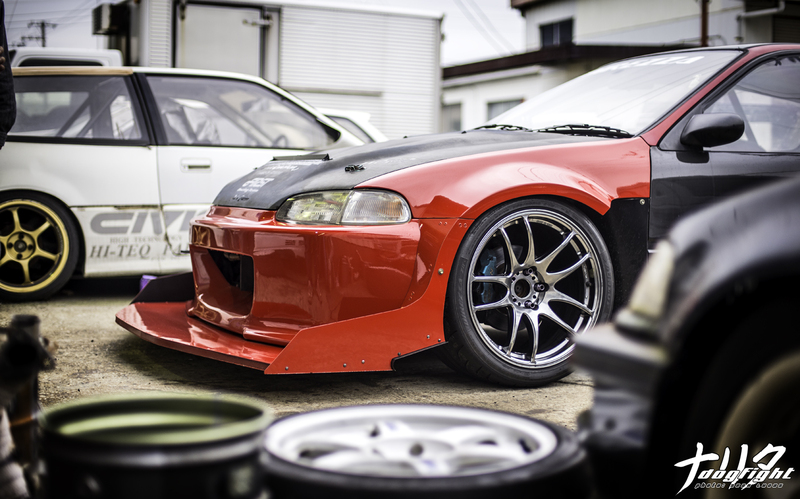 While lacking some of the luster of shops backed with seemingly unlimited funds, Garage Work maintains the true spirit of grass roots time attack and it shows in both their demo and customer cars, as well as their shop itself. Not that other shops don’t, I just personally feel a charm there that I don’t feel other places (maybe I’m just crazy). This uniqueness of the shop is a direct result of the owner, and his right hand man, shop apprentice, and Direzza Challenge regular, Kubo-san, is no different. When Sekinei and I stopped by the shop to surprise Iwata for his birthday I was glad to see Kubo there as well. Just as amiable and enthusiastic as Iwata, he gladly allowed me to photograph his build, as well as show me the little technicalities of his new front end (that, unfortunately, since has been destroyed). So, on this somewhat normal cloudy weekday in Chiba, I did just that. 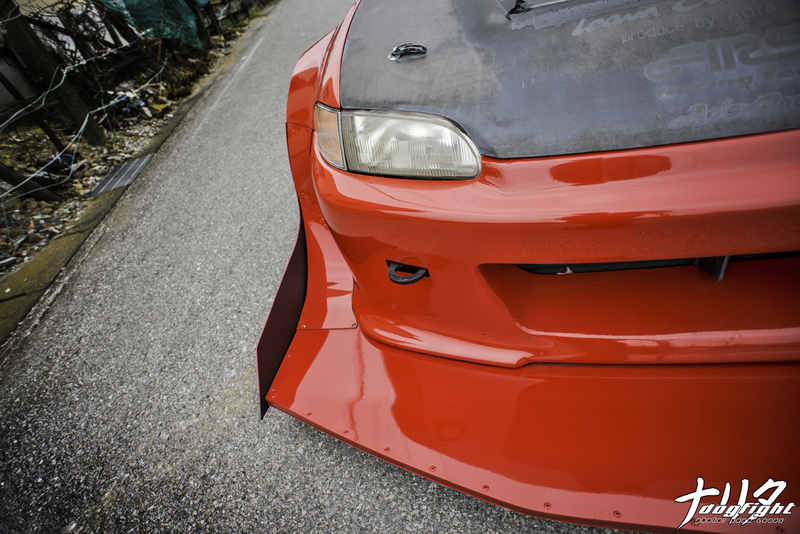 The new front end, a stark contrast to Garage Work’s signature aero, is very sleek in appearance. The splitter being molded into the canards that reach up to the widened fenders; a much different look than the sharp angles and L-brackets of the other cars. The splitter is actually two pieces with a hollowed center that sandwiches reenforcing material. The most unique aspect of the setup has to be the underside of the splitter though. 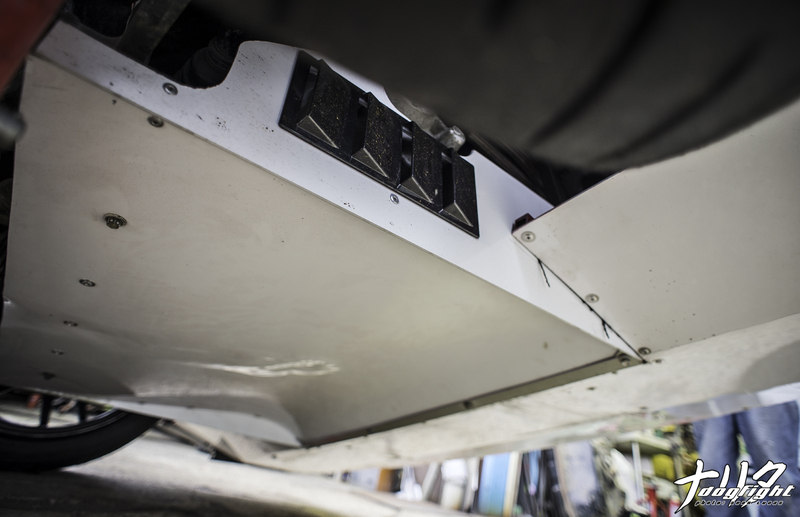 Instead of a flat piece, the bottom of the splitter is formed to allow air to flow more beneficially through the underside. The new fenders are just large enough to fit the massive, GTR sized Kiwami’s underneath. The 18×10 inch wheels are wrapped in a 305 series Direzza ZII. 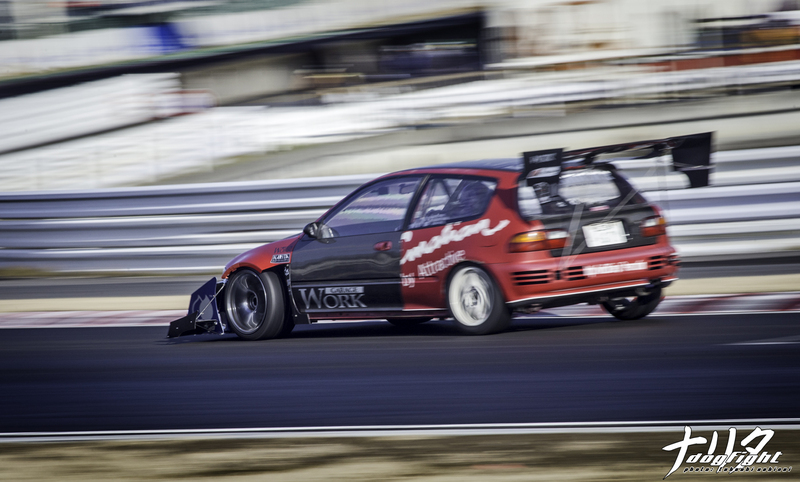 Kubo competes in the Direzza series, and in doing so, has dedicated his current venture to driving on radials. The old carbon fiber hood gives you a glimpse into the history of the shell, with the faded Team Emotion decal remnants barely showing on the decaying clear coat. 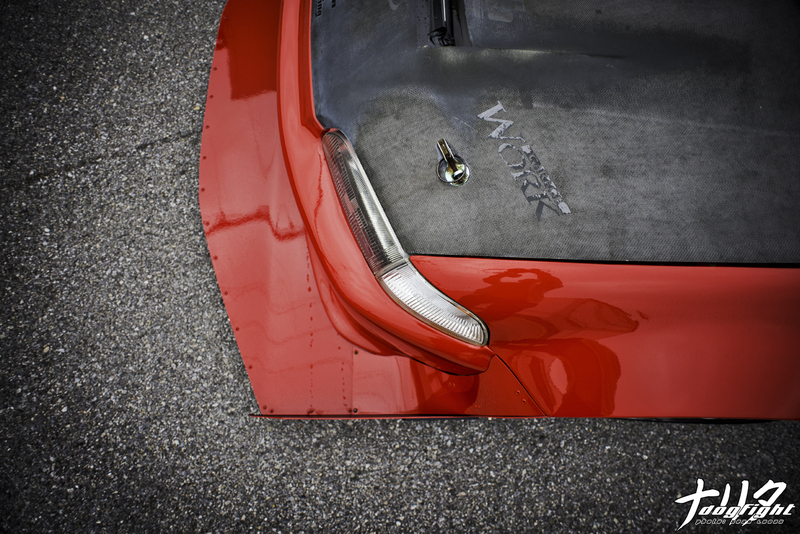 The canard portion is molded to fit the curvature of the Garage Work EG bumper. A little better view – I really like how this picture turned out. 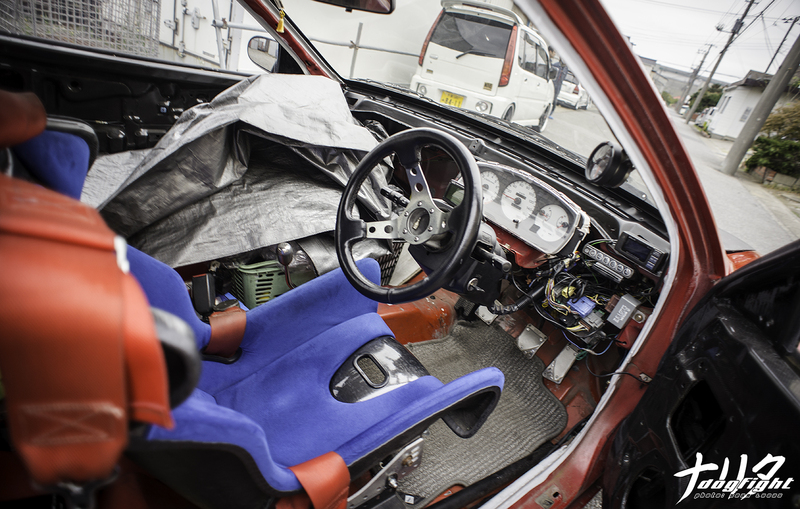 The interior doesn’t leave much to the imagination being completely stripped, mimicking the other shop cars. Even the seat is a simple carbon shell with a tiny bit of padding. 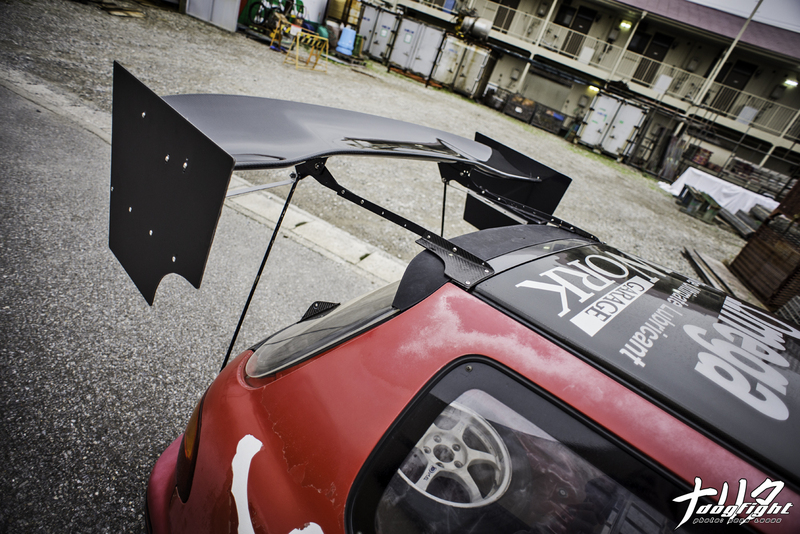 The back hatch of the car houses a custom mounted GT wing that helps stabilize the rear in cornering. 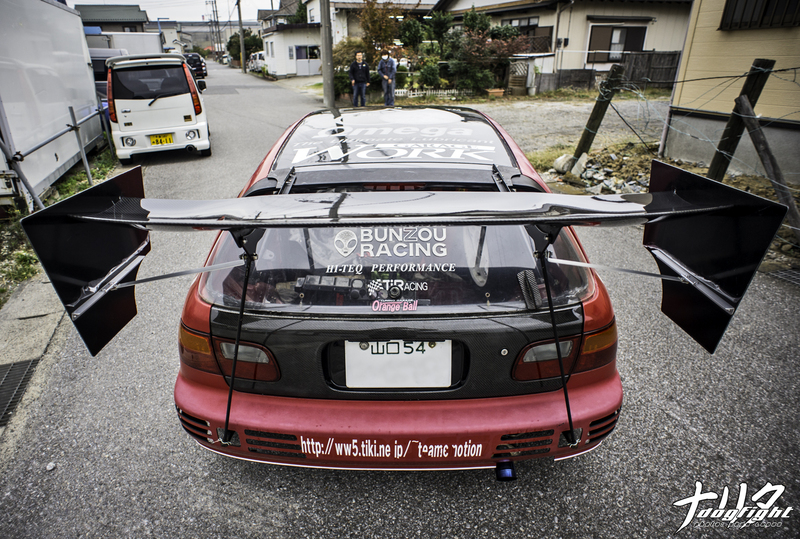 While the GT wing and end plates themselves may be huge, the mounts utilized to hold it are quite the opposite. Small carbon fiber and aluminum uprights are used to maintain the theme of keeping the car as light as possible. This EG weighs just a tick over the 800 kilo mark; while not quite as light as Tora’s, it’s no heavyweight. So, despite the crash preceding the Attack event, he still managed to not only attend that Sunday, but also to break his personal best to put down a lap time of 1’00.167. Which was well enough to take second overall in class, and totally destroy the FF radial class record. Not only that, but he came just .2 seconds shy of matching the ATTK’D R34 time of 59.953 (radial class winner) – take a few seconds to comprehend that speed. Kubo and Tora worked all night to retrofit the front end from Tora’s EG onto Kubo’s. The result was rather impressive, although I would garner most people would disagree with me haha. It does, however, reiterate my feelings for the shop and the individuals behind it. 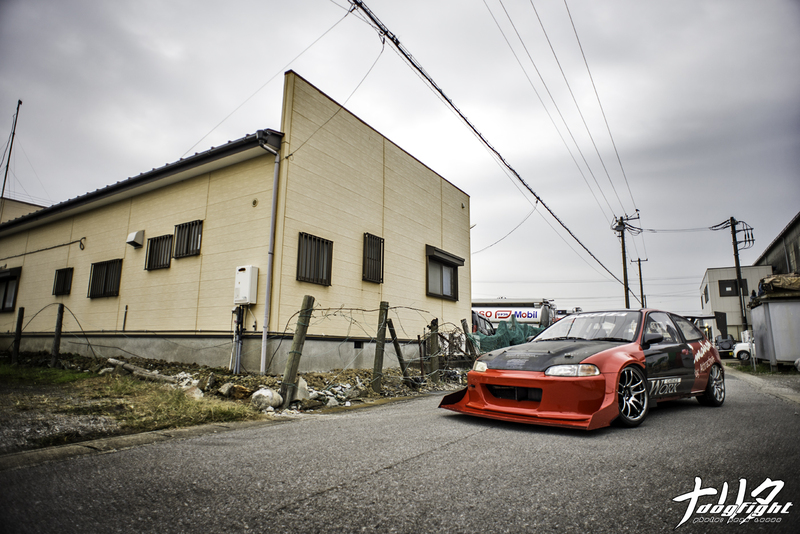 If you didn’t know any better, you would just think that it’s an unpainted front end, and not an amalgamation of two of the fastest EG6’s in Japan. 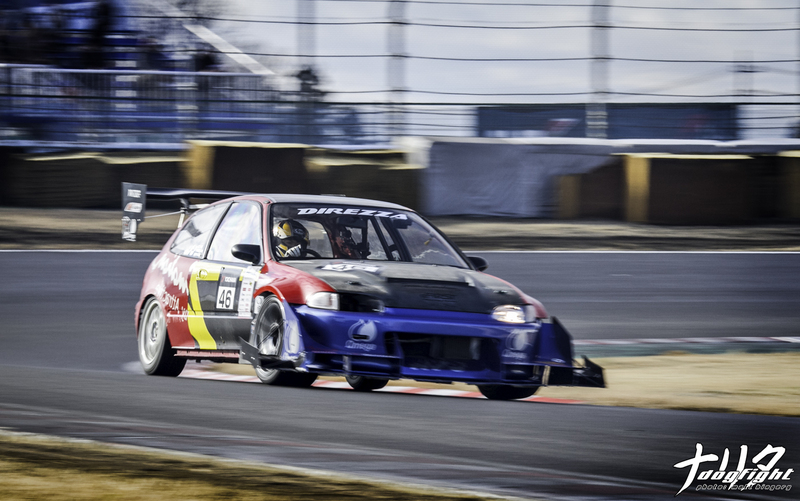 The 220ps B18C pounding away at the top of 4th gear as he rounds the last corner of TC2000 on a warm up lap. The half wet circuit still damp from the early morning rain. Few ins later and a wheel/tire change, he sets off to complete his fastest lap of the day; ultimately taking the record. How they do what they do may not be for everyone, and it sure isn’t the easiest route, but that’s generally the case when you’re paving the road. Redefining what fast is with each event, both Kubo and Iwata will continue to improve and I can’t wait to see how far they will take it, but what I’m more excited for is how they’re going to do it. 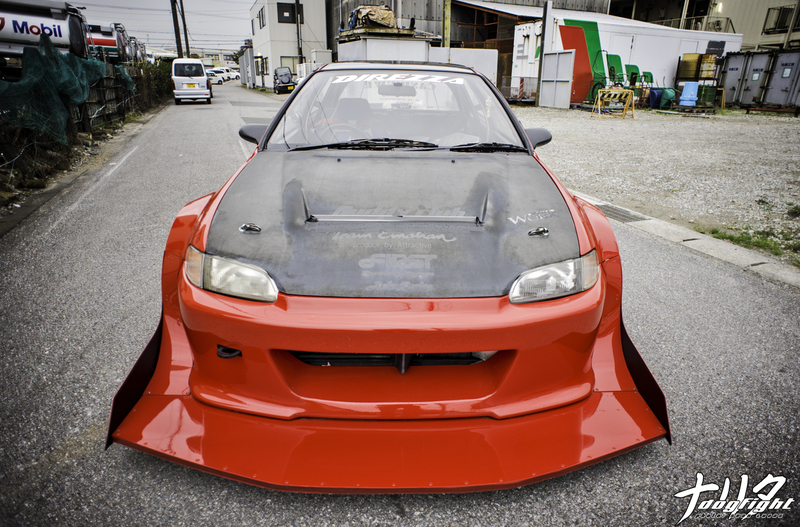 Does he plan on a re-build/reimagining of the front aero specific to his car? Also, any more pictures of the EF in the background of that last pic?